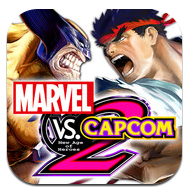 Marvel vs. Capcom 2 (v1.00) — Mobers.ORG — Your Daily Source For Mobile FUN! Wolverine & Iron Man VS. Ryu & Chun-Li! One of the most popular arcade-fighting games of all time arrives on the App Store for your iOS tablet or mobile device! Marvel vs. Capcom 2 brings together legendary characters from the Marvel and Capcom franchises to duke it out in an insane, action-packed, tag-team fighting experience. Pit your favorite heroes in dream match-ups thanks to the robust 56-character roster. With the 2-player versus-mode, unlockable secrets and characters, you better buckle up and prepare to be taken for a ride!